TS Entertainment warned us that with the release of the 3rd title track 'BadMan', B.A.P will show a face that only B.A.P can do and represent perfectly. Watching and listening their new song 'BadMan' I couldn't agree more. 'BadMan' is B.A.P's 3rd mini album which contains their previous songs 'Coffee Shop' and 'Hurricane' and new songs as well. Choosing 'BadMan' as their promotional track, B.A.P wants to make a statement saying that cities are dirty and corrupted and that only care about the superficial things without paying attention to what really matters. But those mindsets are going to change because B.A.P is not afraid to do whatever it takes to change those rules and actions. That concept is clearly seen in the mv as we see B.A.P being against the 'law' and being rebellious by provoking the authorities. 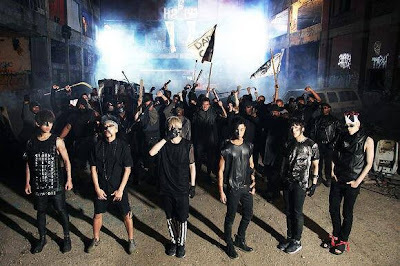 In the end B.A.P is the only last men standing, stating that they kept their promise : They will be the change and everyone should be afraid of them because they messed with the wrong people ( or group ). In the mv we also see that no one is paying attention to other - minor? - things such as the lovely couple or speaking general the 'daily life' or the even more significant thing the man who got shot and died in the alley. Everyone is so busy with what's going on that these small things don't get the proper attention. 'BadMan' is a song that combines hip hop music as a new genre called 'Trap'. I guess that while B.A.P were on their world tour they had been influenced by different types of music and thus we can see their new and improved side of them in their 3rd mini album. Plus the song is written by Bang Yong Guk so that makes it more special. All the songs have a different feeling so that you can choose your favorite song according to your style. Note : I don't know who chose Daehyun to sing the first lines in the song but whoever made that decision is genius! Daehyun impresses us even more with his new manly-dark voice. Babyz check the mv and sing along with B.A.P : I'm a BadMan.